Chirnside, Berwickshire, Scottish Borders, TD11 3LD. Tel: 01890 818 219. Map & directions. Attention to detail, where nothing is too much to ask! Chirnside Hall is a small country-house hotel in the Scottish Borders. Privately owned by Christian Korsten, it combines the best elements of traditional and modern hospitality - fabulous nineteenth-century architecture with twenty-first century comfort. The house was built in 1834 as a holiday home for an affluent Edinburgh businessman. Almost two centuries later, it remains a wonderful and relaxing retreat. The elegant dining room and bedrooms are the perfect backdrop for good food, roaring open fires, and stunning views of the Cheviot Hills. Secluded and peaceful, and just a short drive from the Lammermuir Hills and Berwickshire coast, Chirnside is still convenient for the shops and sights of Edinburgh and Newcastle. As a small and independent hotel, we’re here to indulge you. We try to meet your every need – from recommending a good place for lunch, to telling you the best walks, or helping you dry out your boots after a great day in the Scottish Borders countryside. As a result, many of our guests return to us again and again – it’s a version of country-house living that’s better than the real thing! We are pleased to announce that Chirnside Hall Hotel has been recognised by the Good Hotel Guide 2015. Inclusion in this printed hotel guide is based on merit and guest feedback. To arrange your stay at Chirnside Hall Hotel you can preview our bedrooms, view dining facilities and a sample menu, discover local attractions and check availability and book securely online. 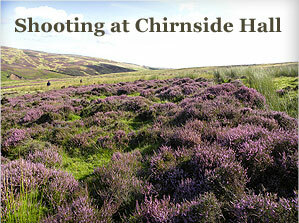 Chirnside Hall Hotel, Chirnside, Near Duns, Berwickshire, Scottish Borders, TD11 3LD. Copyright Chirnside Hall Hotel. All Rights Reserved.